Ladies personalised single butterfly lace corner cotton handkerchief embroidered with monogrammed initial set in a lovely Victorian Floral frame. Ladies personalised single butterfly lace corner cotton handkerchief embroidered with monogrammed initial set in a lovely Victorian Floral frame. 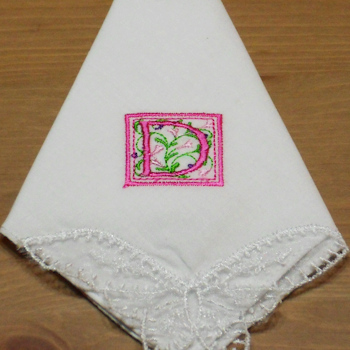 Every lady should have a lovely handkerchief in her handbag. A single smooth white cotton handkerchief with a beautiful butterfly organza to one corner (great as a anniversary or wedding hanky too!). A single smooth white cotton handkerchief with a beautiful butterfly organza to one corner (great as a anniversary or wedding hanky too!). Just fill in the option boxes and choose what colour embroidery thread you would like for the monogrammed letter and coordinating frame surround. You can choose from one single hanky or make it a gift set of three handkerchiefs.